For no particular reason, I decided to watch Ryan Giggs Secrets & Skills, a 1994 video in which Giggsy teaches youngsters how to play while revealing a few truths about his life as a footballer. The 90-minute film is a curious document because it’s neither one thing nor the other. Its sections of training ground instruction, in which a deadpan Giggs shows a group of children how to dribble, pass and shoot (with the help of Bobby Charlton and a coach named Bryn Cooper), are mixed with Man Utd clips and interview snippets. That sounds fairly straightforward — a sensible cash-in for Giggs at his most boyish and handsome — but the video often errs, sometimes in barely visible ways, into strange territory. There’s the gentle bullying of a volunteer goalkeeper, for one. There’s also the sight of the unfamiliar Cooper doing press-ups in order to motivate the kids, and of Paul Ince inexplicably untucking Alex Ferguson’s shirt. But there’s much more than that: Ryan Giggs Secrets & Skills acts as an eerie prelude to the personal controversies that would tarnish Giggs’ reputation in the 2010s. It’s a skills video, yes, but it’s also a complex and compelling manifesto on privacy in the celebrity age. That’s not to say that Ryan Giggs Secrets & Skills doesn’t contain useful footage for youngsters learning the trade. The bulk of the video revolves around an informal training session at The Cliff, United’s former training ground, where Giggs, Charlton and Cooper guide a group of youths around the game’s most important skills: control, heading, passing, crossing, shooting, etc. You could argue that a VHS isn’t the best way to learn football, but Giggs’ does his best to pass on what he knows. He’s having a good time, the kids are having a good time, Charlton and Cooper are having an exceptionally good time. The only person not having a good time is volunteer goalkeeper Fergal Larkin, whom Charlton dubs “the worst goalkeeper in the history of the world”. From an adult perspective, none of the tips are especially eye-opening (aim a free-kick wherever the goalie isn’t), but seeing Giggs’ footwork up close is enjoyable, as are the Welshman’s string of unsuccessful attempts to score a half-volley. And yet, as the children gleefully attempt their step-overs and one-two finishes, there’s this shadow lurking over the whole exercise, something stirring behind the bright graphics and uptempo music. Behind the skills lie the secrets of Ryan Giggs. This is Giggs’ take on the subject of MOODS, a clear outlier in a section whose other categories include simpler things like FOOD, TELEVISION and FILMS. The United ace laughs his way through those various topics: his laziness in the kitchen, his fondness for McDonalds and ‘Kentucky’, Al Pacino and Robert De Niro films, the time he soaked his team-mates with a fire extinguisher. And at first glance, these appear to be the ‘secrets’ we are promised. Yet every time the mood appears to lighten, the subject returns to the issue of privacy and the fraught relationship between fan and celebrity. “I can’t go out anymore and do things that I used to be able to do,” Giggs admits in the video intended for children. “I’ve got to be very careful where I go out and, you know, what I do when I go out. It says something about the complexity of Ryan Giggs Secrets & Skills that the title appears to change meaning multiple times. At first glance, you might imagine the ‘secrets’ to be Giggs’ personal tips and tricks for aspiring footballers — ‘secrets’ as in technical knowledge of the game, the word crowbarred in for alliteration more than anything else. When you get familiar with the video, however, the meaning of secrecy becomes clearer. The secrets are those little facts about Giggs’ life — the fire extinguisher japes, the bad eating habits. Only with more than 20 years of hindsight can we see what Ryan Giggs Secrets & Skills is really about. The ‘secrets’ aren’t contained in the video at all, though they are its subject. They are the secrets of the celebrity kept hidden from the leering observer. Secrets, however mundane or scandalous, that are as much the product of intrusive fan culture as they are its juicy object of desire. They are Ryan Giggs’ life, behind closed doors, just waiting to burst out in the most dramatic and unpleasant way. 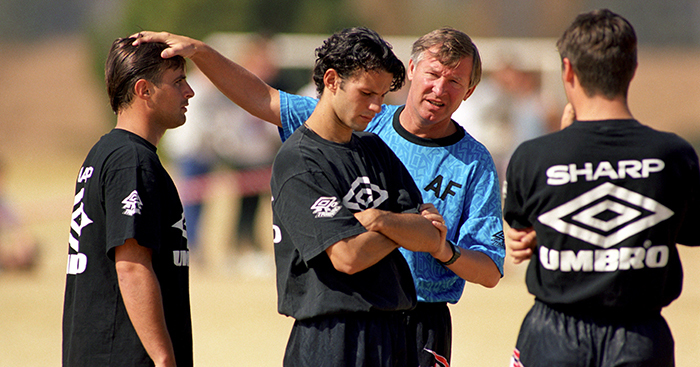 “There was only one time where I wished I was just one of the lads,” Giggs recalls. “Two years ago when I went on holiday, it was about 10 of us went away, and every night I was just getting hassled, just getting people asking me for autographs and pictures. “I’m just getting hassled every minute, you know, every minute of the day. I was just relaxing on the beach and people would come up to [me] and want to talk to [me]. Ryan Giggs Secrets & Skills is a cry for help from a player who just wants to be left alone, and a forewarning of what can happen to the human psyche when that wish — that very modest wish — isn’t granted.